Say hello to the fabulous Blossom! 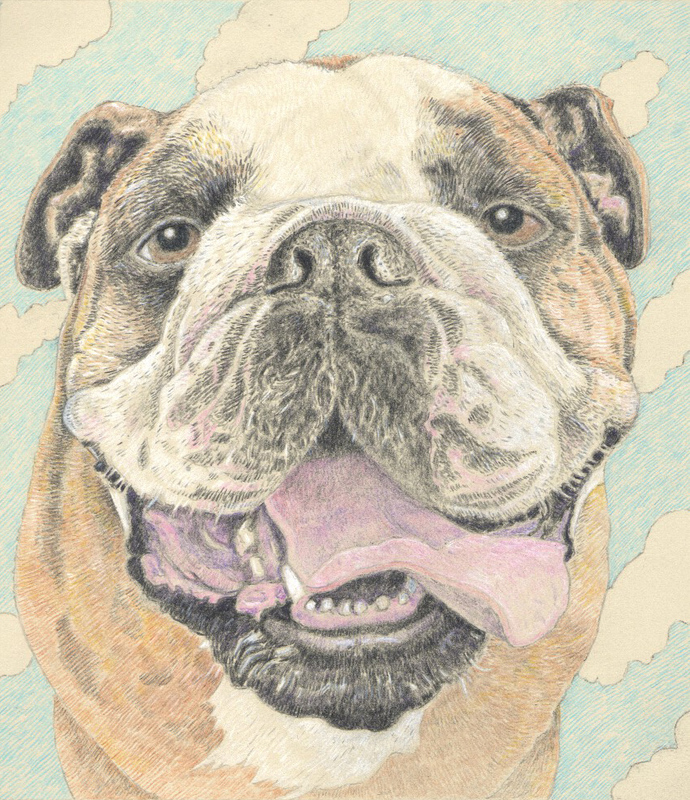 Done in colored pencil, Todd’s latest portrait is absolutely perfect for celebrating Tongue out Tuesday! A custom portrait is a true piece of art. There are online services that will take a photo and gussy it up with filters and screens and even print it out on a canvas for you. But none of those are true works of art. Todd depicts his subjects in richly dimensional environments and is known for capturing the spirit and personality of the pets and people he paints. Todd approaches each subject with empathy and care to create a distinctive piece of original art. A custom portrait is surprisingly affordable. Our prices start at just $175 for unique artwork created just for you. Check out Jimmydog.com for our easy-to-understand pricing guide. A custom portrait is thoughtful. Your loved one will know you didn’t just grab a gift card off the rack at the last minute. A portrait shows you’ve taken the time to think about what they love most and commissioned a well-known portrait artist to create a gift specifically for them. A custom portrait is perfect for all ages. Whether age 15, 35 or 85, everyone is touched by the gift of a portrait featuring their favorite people or pets. A custom portrait is perfect for all sizes. Unlike with clothing, you never have to worry about a portrait not fitting. Todd paint portraits in sizes from 8×10 to 24×30—perfect for every budget and any home. Custom sizes are available, too. A custom portrait is timeless. Every holiday season, there’s a trendy “must-have” gift. And by the next year, that once-hot item is sitting in a drawer or closet, forgotten. A custom portrait never goes out of style and will be treasured for years to come. A custom portrait is perfect for the person who has everything. Everyone has that hard-to-buy-for person on their list—the one who doesn’t need any more clothes, knickknacks, electronics or stuff. A custom portrait is a thoughtful, highly personal gift. Even the person who has everything will enjoy hanging their portrait in a place of honor in their home. A custom portrait endures. While cookie tins and fruit baskets make delicious gifts, they don’t last long (at least not around our house!). But a portrait will bring your loved one years of enjoyment. 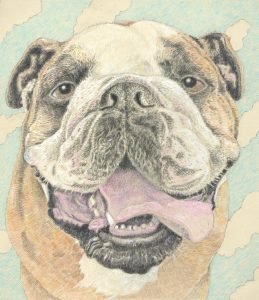 In fact, portraits often take on more meaning over time—for instance, becoming a treasured memorial of a pet who later crosses over the Rainbow Bridge. And, practically speaking, all Todd’s portraits are created on acid-free, nonyellowing heavy paper stock. Plus, we can give you additional framing tips to make sure your portrait never loses its original detail and vibrancy. Now all you need to do is visit our website at Jimmydog.com, call us at 336-201-7475 or email us at todd@jimmydog.com. And don’t forget: We also offer gift certificates. They make great gifts, too! This holiday season, skip the sweaters and ties. 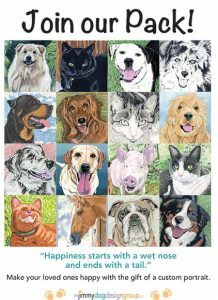 Give your favorite people a truly personal and unique gift: A custom pet portrait painted by Todd just for them! Our clients tell us a custom pet portrait is one of the most meaningful gifts they’ve ever received. Portraits earn a special place in their homes—and in their hearts. Commissioning a portrait is easy and affordable. Order now to ensure holiday delivery! We at Jimmydog, including our dear Freddie girl, have been heartbroken and horrified by images of recent natural disasters. Freddie’s been particularly worried about animals who had to be abandoned or were separated from their people. 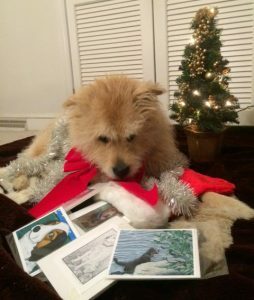 She never wants anything like that to happen to your pack, so she took some time to learn about emergency preparedness for pets. It’s not fun to think about, but a little planning can save you from the unthinkable—losing your pets in a disaster. As usual, Freddie just wants to help! Although Stephanie and Todd, the best people ever, try to protect me from bad news and general unpleasantness, as I wander through the house to my next napping spot, I can’t help but see images on TV of hurricanes, fires and earthquakes—and most upsetting to me, scenes of pets left behind or separated from their people because of the disasters. I can’t imagine how scary it must be as a dog—or gerbil or ferret or parrot—to be without your people as waters rise and walls crumble down. They would never show it but I think even cats would be terrified. What I’m saying is everyone needs a plan in case something happens and you are forced leave your house in a hurry. Stephanie tells me President John F. Kennedy said, “The time to repair the roof is when the sun is shining.” She also tells me he loved animals and had a Welsh terrier named Charlie, so he must have been a very smart person. Anyway, the idea is that you should prepare for bad stuff when no bad stuff is happening. So, here’s what I recommend: On the next sunny day, spend a little time making a plan and gathering emergency supplies. Chances are you’ll never have to use any of it—your life will be filled with sunny days. But if you need it, you’ll be able to keep your whole pack together and safe, just as you are meant to be. * Put your name, address and phone number on all your pets’ collars. Because cell service can go out or be spotty after a disaster, it’s a good idea to add a landline number or the cellphone number of a friend or relative in another part of the country. * Create an evacuation plan. Figure out which directions you would head and where you might stay. Best Friends says it’s a good idea to check for pet-friendly hotels, animal hospitals and animal shelters at your planned destinations and along evacuation routes. If you have a lot of pets or unusual pets (a flock of chickens, horses, potbellied pigs, goats, snakes), see if there are animal refuges or large-animal boarders who could shelter your pets in an emergency. * List of animal shelters, animal hospitals and pet-friendly hotels. Best Friends says even if you have all these things in the house, you should gather them together in one tub or bag so they are ready when you need them: Sometimes you don’t get much warning. And don’t forget to update your emergency kit (restock with fresh food, update lists of pet-friendly hotels, etc.) twice a year. Whew! That’s a lot. I’m glad taking care of stuff like this is Stephanie’s job, though I promise to accompany her on a car ride to the pet store for provisions because I’m helpful like that. After you’ve made your plan and put together your emergency kit, you deserve a treat. May I suggest a cuddle with the cat or a walk with the dog?